Tom Brady will appeal his four game suspension by the NFL for his alleged role in using improperly inflated footballs in the 2015 AFC Championship game. Monday night, at player Rob Ninkovich's charity ping pong tournament at Fenway's "Game On," necn cameras caught the arrival of star players Julian Edelman and Rob Gronkowski. Gronk took a comical approach when asked about the appeal. Reporter: "Hey Gronk, How do you feel about Tom Brady appealing deflategate? 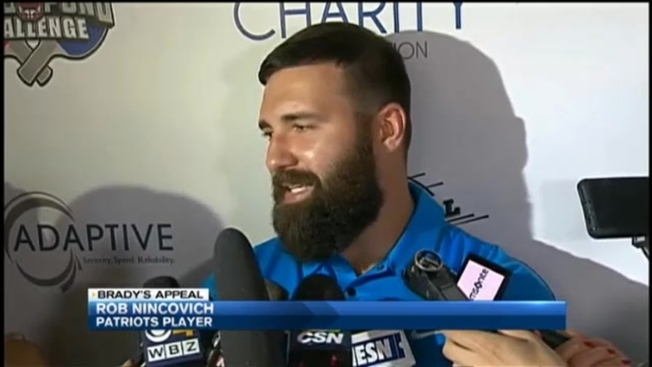 Ninkovich is also focusing on the positive. "I'm just here having fun with my teammates. Here for a good cause," he said. This time around Brady has added another lawyer to his legal team who argues Commissioner Roger Goodell's "biased, agenda-driven, and self-approving appeal ruling must be vacated." "It's very rare, under the rules themselves it's supposed to only be done in extraordinary circumstances, when there is some major issue of justice that has to be resolved, the feeling here is that this really is an issue that is confined to the NFL." In the meantime, Patriots fans said Brady has their unwavering support. "I think the science supports he didn't do anything wrong," said one fan. "The guy's an upstanding guy, great citizen. He doesn't have to do anything underhanded. His abilities are far too superior," said another. If the appeal is denied by the full panel, Brady could try to take his case to the Supreme Court.